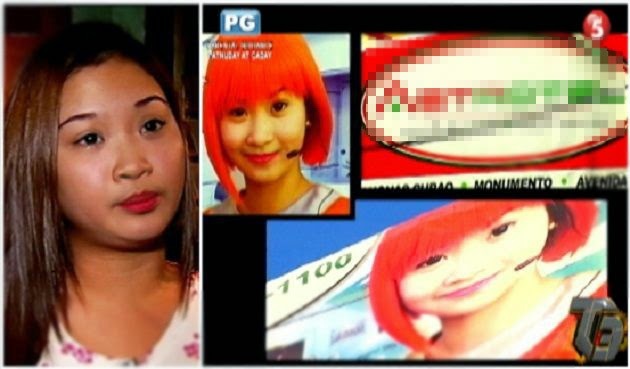 Arriane Foronda, a former worker of a famous hotel in Caloocan known as the “Astrotel Hotel”, filed her complaints against the motel to “T3 Enforced” after they allegedly used her picture in its advertisements without the consent of the 21 year-old. What they told her was that they will use her photo in a bulletin board to promote the hotel but to her shock, her face had been plastered on billboards and tarpaulins instead. It was just tarpaulins at first but soon, these stickers were placed on buses, and then even on jeepneys. Foronda did not like the idea of her face being displayed on posters. According to a report made by Ben Tulfo on TV 5, Foronda had worked for almost four months in the said hotel and these posters just popped out one after the other after Foronda resigned last May. She said that she was made to wear a uniform and take photos while wearing it. She thought that only the uniforms will be shown during the taking of the photos. The photo shoot, apparently, took place in order to show newly hired employees how to wear formal attire. Foronda feels very embarrassed about the incident and she said she even received ill reactions from those around her. She wants action to be taken so that her picture would be removed from public places, considering that she did not even give the motel the permission to publicize her face in their advertisements. When asked about the issue, the hotel did not deny that Arriane Foronda was indeed the model they used in the tarpaulins found in different parts of Caloocan City. The hotel’s supervisor Marlon Hermosa, however, claimed that the ex-worker knew that her picture will be published and might even be promoted to higher forms of advisements such as tarpaulins and the like.